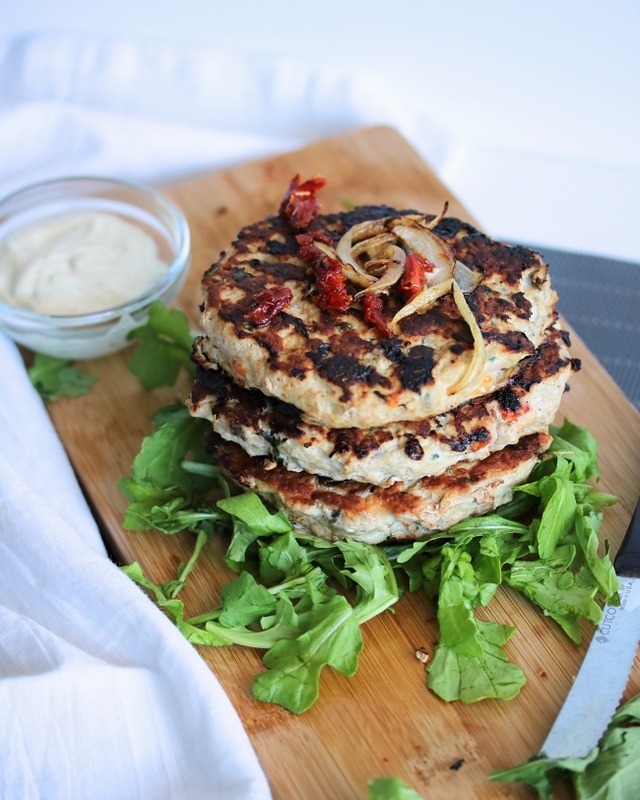 If you're looking to switch up your dinner options with a leaner protein, without losing out on flavor & moisture, these turkey burgers are for you! I like to buy ground turkey every now & then so I don't get too burnt on ground beef~ gotta switch things up sometimes. I know turkey comes with a negative connotation sometimes; many people hear turkey & think "dry, flavorless, health food, diet, etc."... not fun words. 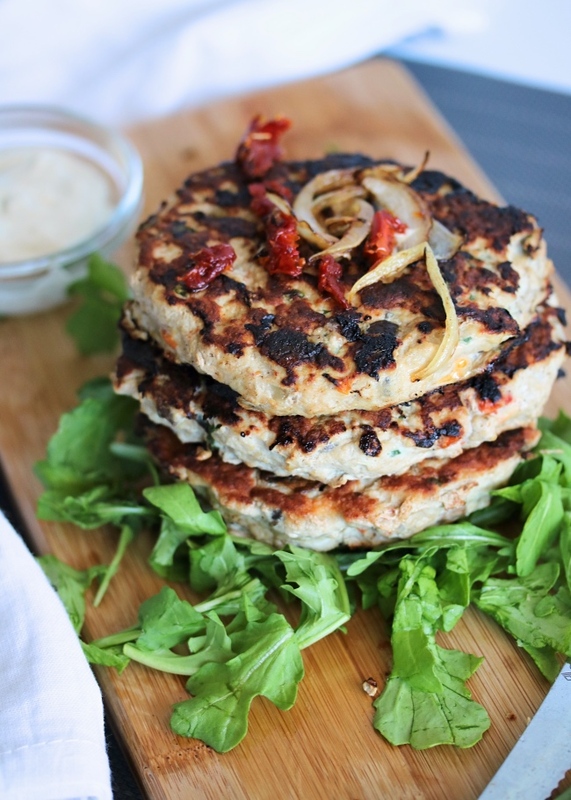 These turkey burgers will change your mind! I stuff them with tons of veggies for nutrients, egg whites for moisture, and fresh garlic and sun dried tomatoes for big flavor. These are really simple to make & can easily be stored in the refrigerator for a quick protein option during the week. 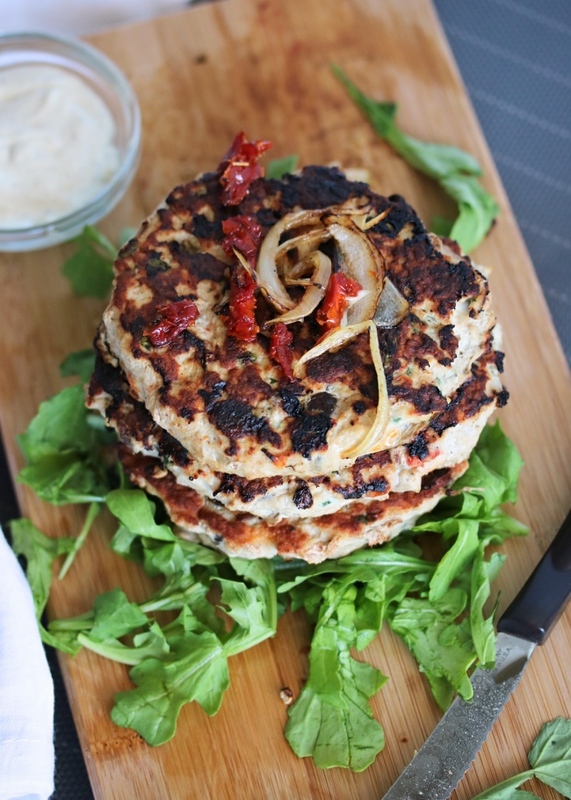 You could also freeze the patties before cooking and save them for a rainy day. 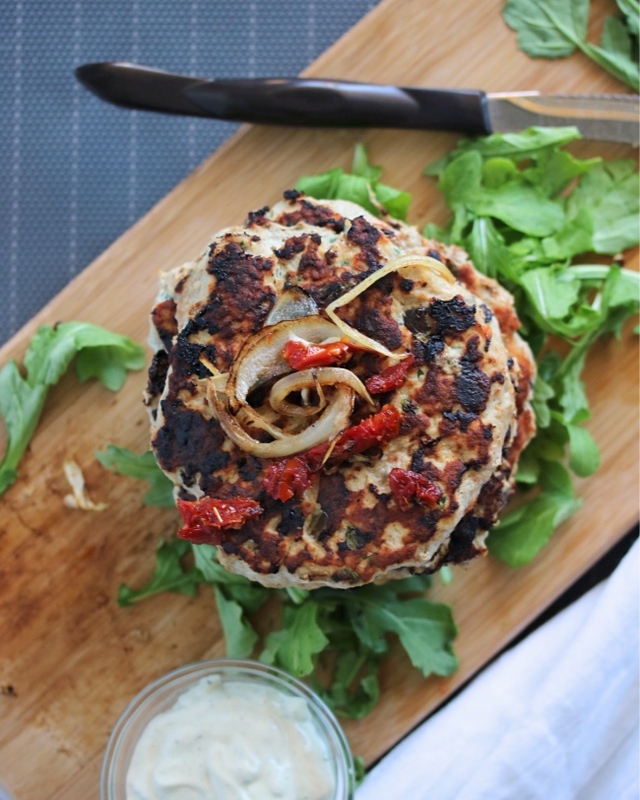 I hope you enjoy these juicy, flavorful burgers! 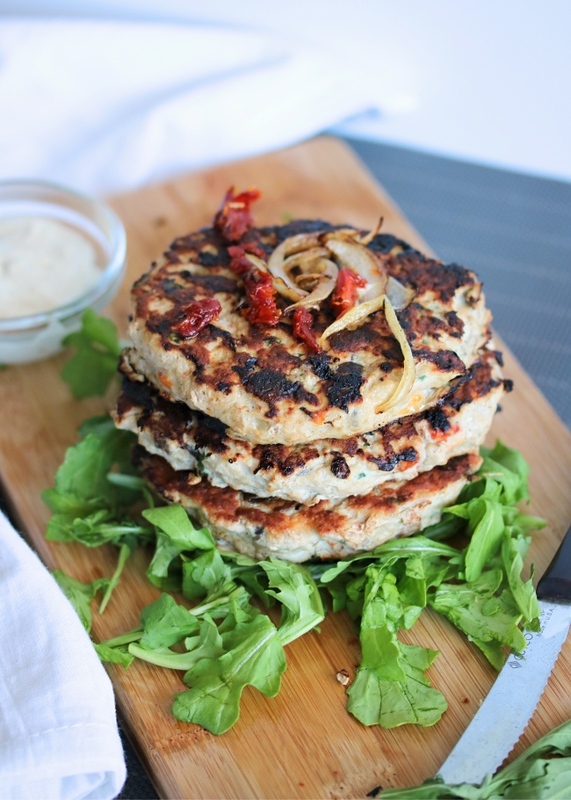 They are so delicious, you'll never believe they're Whole30 and Paleo! Melt the ghee in a skillet over medium heat. Add the mushrooms, onion, garlic, and arugula, and cook until the veggies just begin to soften and greens are wilted (about 3 minutes). Divide the mixture & shape into 4* equally sized patties. I pinch with my fingers to make them a little thinner in the middle (helps keep them from getting too round when they cook). Sprinkle each side with salt & pepper. Heat a large skillet to medium-high heat, and coat with cooking oil of your choice (I like avocado oil). Add all four patties to the skillet and cook for 6 minutes. Flip the burgers, and continue cooking for 4 minutes. Step one is optional! If you're short on time, just mix the raw veggies in without sautéing (this just adds more flavor). They will cook just fine with the burgers! If your meat mixture doesn't seem firm enough to form a patty, add a couple of tablespoons of flour (almond, coconut, whatever you have on hand). 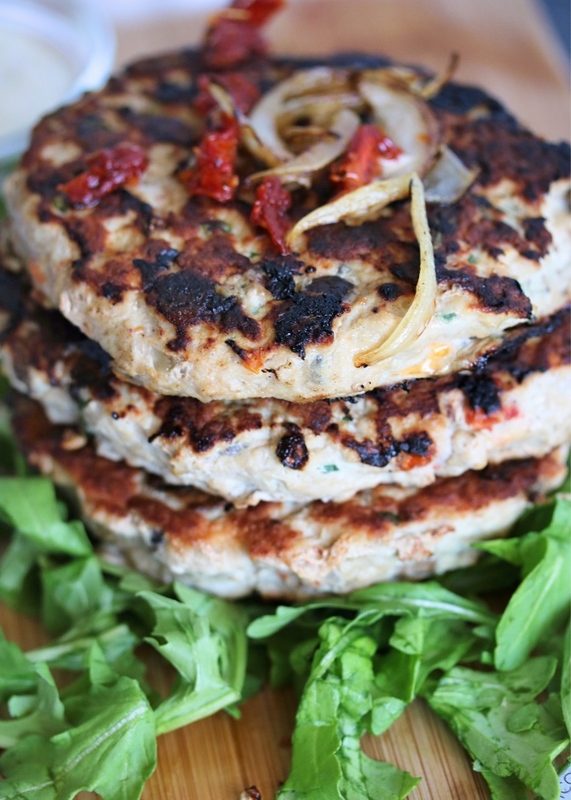 You can also make these into smaller patties, and treat them more like a slider. Feel free to substitute whatever other mix-ins you like: green onion, bacon, prosciutto, roasted peppers, etc. Thanks for the idea. Tried this today and I LOVE it. With the mushrooms and onions that should be the perfect combination of moist and crispy. Hi! Has anyone ever baked these in the oven instead of frying? I am not good at frying! Lol!